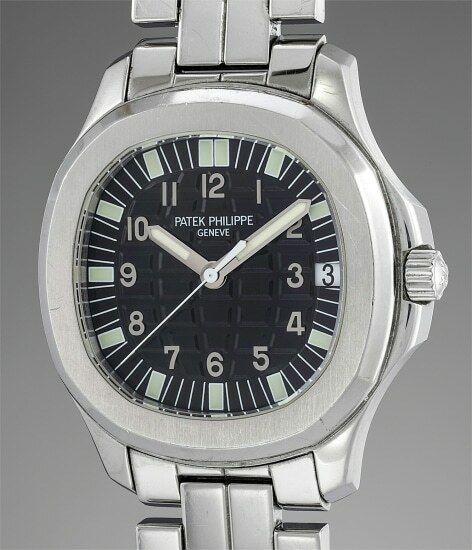 Patek Philippe has only ever made two sports watches: the Nautilus and the Aquanaut. Both share a number of signature design elements implemented in Gerald Genta’s original design, including a rounded octagonal bezel with a brushed surface and polished, bevelled edges. But with the Aquanaut, Patek Philippe also introduced several new features that would attract a younger consumer base to the brand and consecrate the then revolutionary pairing of rubber straps with luxury sports watches. Launched in 1997, the Aquanaut presented a new more casual alternative to the Nautilus. Initially limited to 1,000 pieces, in gold and stainless steel, the Aquanaut was put into regular production with the release of the reference 5065A. Nicknamed the ‘Jumbo’ because of its large, 37mm case diameter, the new Aquanaut revealed the once concealed self-winding calibre 315 SC through a sapphire display caseback. The present, early reference 5065/1A-001 is unlike any of the future models. It is the only variant of the reference ever sold as a package that included both the rubber composite strap and steel bracelet, an option much loved. Even for a casual, sporty wristwatch, significant planning and attention to detail went into the design for the Aquanaut. The embossed, oversized guilloché dial is reminiscent of the brick design of both the steel bracelet and the rubber strap. Significantly more luminous material is used on the dial of the Aquanaut in comparison to the Nautilus, and the hands and indexes are consequently thicker. Preserved in exceptional condition for almost two decades, and accompanied by all of its original accessories, the opportunity to own this very rare and original Aquanaut "Jumbo" is one not to be missed.